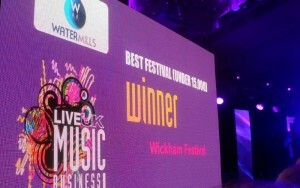 It has been named the Best Festival (Capacity under 15,000) at the prestigious Live UK Music Business Awards. They beat off strong competition from Dorset’s End of the Road and the Slam Dunk Festival in Leeds to claim the crown. 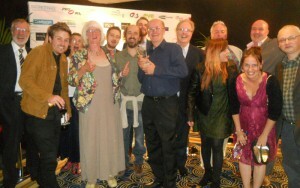 The announcement was made at the gala awards evening in London last night (October 15) and is a fitting reward for the hugely successful event staged at Wickham in August when record crowds flocked to the picturesque site to see the likes of the Proclaimers, 10cc, Billy Bragg and many more. 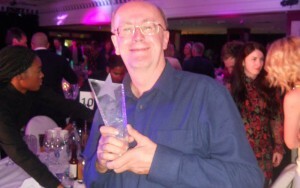 Organiser Peter Chegwyn said: “We are absolutely delighted to have won, especially given the quality of the opposition. “We were thrilled just to be nominated for this coveted award and then to make the top three… but to come out on top is a fantastic achievement. “We are stunned but very proud. It is a fitting tribute to all the people who work so hard to make this festival such a success and to create its unique relaxed atmosphere and family feel. Now in its sixth year, www.livemusicawards.co.uk is the only event committed to presenting awards to the business people who drive the country’s contemporary live music industry. The awards recognise excellence and talent among promoters, venue operators, festival organisers and agents, through to artiste managers, tour managers, show producers, brand impact and record label partnerships. Chegwyn added: “The success in not just down to our staff and the artists but also to the fans who have fallen in love with the Wickham Festival so it is only right we share our success with them. Until the end of October, anyone booking an adult weekend ticket for next year can get a £50 discount. “Although it is nice to see our efforts recognised like this, the greatest reward is seeing thousands of smiling faces – and the biggest testament to our success is that so many people come back year after year. “We have already had a record number of people booking for next year before we have even announced a single act. They know there will be a top quality line-up and they know the atmosphere and amenities will be as good as ever. “People regularly come from all over the world. This year we had more than 25,000 fans with not a single crime reported and we are looking forward to welcoming them back next year. The 2016 event takes place from August 4-7. To celebrate this award, until the end of October fans can save a third on a weekend ticket – a reduction of £50 on a four-day adult ticket. Contact eastfest@talk21.com for details.